Finally decided the Sodastream wasn't cutting it. Thought I would make the real thing. I decided to use a Wunder-Bar gun as it takes almost no counter space yet can have 12 flavours per gun. Because I always wanted my own home soda fountain. Since I don't have any cabinets or space to put this, and to be able to move it to my next house (someday). I'm going to build a cabinet just for this. Using a 36" sink cabinet with a bar sink. Total price for this project ~Ouch! Almost all parts were new hence the high price. I bought the cold plates used. (RD3) Since I know my house has a bit of silt in the water. The water filter must have a good pre-filter. 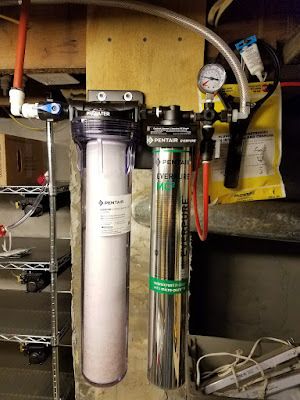 I found that Pentair had what I needed with a price that I could afford. 3m Cuno might have been nice, but they cost a fortune. Besides the water here isn't really bad enough to warrant such extremes. This cabinet will have to be built over the floor vent. So it will need a platform to allow airflow. 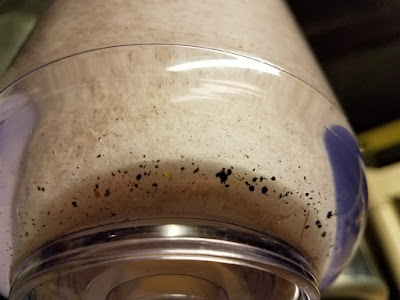 This is why you want a pre filter when using sub micron filters. Syrup pumps installed, hoses zip tied out of the way. I buy most of mine through Sam's club as the club has them in store and online with pretty cheap shipping. Search for "BIB syrup". For other generic syrups I buy from Webstaurantstore. I will try select drink next. Syrupsupply has a ton of stuff but very expensive shipping. ebay even sells some BIBs that aren't anywhere else. After MUCH trial and error, a glycol chiller will not be used. Too many tubes, potential leaks, and hard to maintain. New approach idea is to use a really large rubbermaid storage bin that can hold the cold plates and have a countertop ice maker sit on top churning out ice as needed. Ice maker only needs the bottom bucket cut out and the pickup tube moved for modifications to make it work for this purpose. 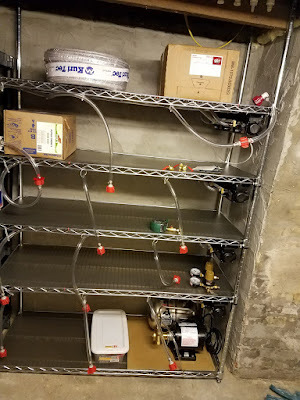 I will use a small fish tank pump for water chiller lines to keep the syrup/soda lines cold. I found a the best tubing to use for syrups are made by Kuri Tec Corp. called barrier tubing, comes in 2 kinds. braided hose Bev-Seal Ultra 175 and pex like tubing Bev-Seal Ultra 235. Im going to use the braided type as more flexible and easier to work with. Installing the rack figuring out what parts I need to finish. Started with the build. 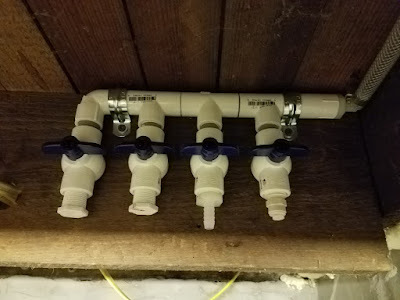 Installed water filter housing with a homemade distribution manifold for carbonator, icemaker, sink + future addon. 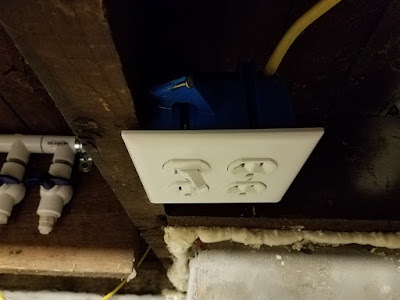 Also a switched power outlet for the carbonator. Decision made on water filter. Page updated, research links added. Now to design the cabinet. like how to mount the manifold and holding cup for the gun. Finding the perfect water filter was tricky. Looked at what the commercial guys use and what coke recommends on their coke solutions page. I ended up settling on a Pentair Coldrink- MC2 EV932801 its pricey at $300. But this will be for a ice machine, soda fountain, coffee maker. Filters for this are also cheaper than me building a system with a bunch of cheap filters in parallel. The shear amount of so many little fittings is quite tedious. Now on to design issues. I'd like to use drinking water filters yet they don't state their flow rate. More research needed. hmm, so fresca is a diet drink. serves me right for not looking at the label in years past. But, that explains why it's harder to get. Diet syrups, as I have read, have a shelf life around 6 months where regular sugar syrups are much longer as sugar is a great preservative (just think pancake syrups). 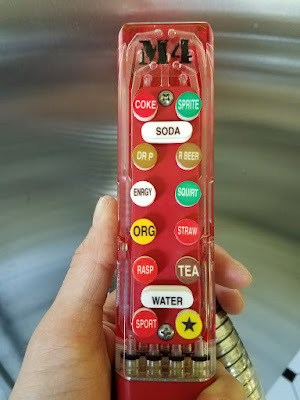 I found that the bar guns buttons are field changeable to how many are carbonated and uncarbonated there are. Just have to change the butterfly plates. So if you had a 12 button gun with 6 carb,6 non carb. you could change that to 8 carb 4 non carb. Been looking for A&W Root Beer BIB syrup, and simply cannot find it. Fresca too is out there but a bit rare. Finally found what syrup pump to get a Flojet T5000-140. Still working on the design of a diy cold plate chiller. My idea at the moment is to use a mini fridge with an external controller and have the plate immersed in DI water. I think I also decided on the Wunder-bar M4-14840 as it has 8 carbonated and 4 non carbonated buttons. With that many I should always have room to add a flavour.